Other than this blog, I don't "live" that many other places on the web. I have an Instagram account that I rarely use. I don't have a Twitter account. I'm on Facebook, but really limit my "friends" there to keep it manageable. If you want to know what's up in my life... this is where to find me! 1. My 16th Birthday. 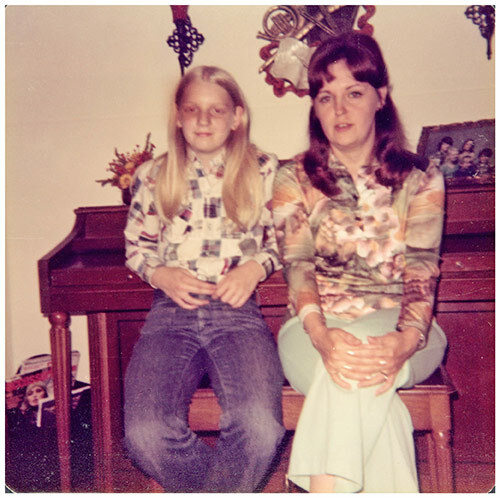 This is me around my 16th birthday with my Mother, Sandy. I had met her when I was 9, but hadn't seen her again until this visit. We were living in Elmira N.Y. at the time. And I *think* it was this visit that cemented the friendship between my Mother and my Mom, Sue. What did we do while she visited? I have NO idea! Memory is a fickle thing. 2.70's styles. The long straight hair parted in the center. Button front shirts (usually flannel) and blue jeans. Probably bell bottoms. And most likely I was wearing a pair of work boots with this outfit. I have no idea why we all thought this was fashionable. Ick. This style also did nothing to help me look my age. I look about 12(?) in this photo! 3. Piano Lessons. I wanted to learn to play piano. So Mom rented one from a local piano store and I took lessons. This was during a time when we were really poor (single Mom, 5 kids, trying to get herself through nursing school while on welfare) so I don't know how Mom found the money to pay for the rental and lessons or what she sacrificed to give me this experience, but I'm sure it wasn't easy for her. Unfortunately, either my piano teacher wasn't paying attention, or I was good at faking it because I never did learn to read music. I would painstakingly count out the lines and spaces "ACEG" and "EGBDF" to figure out what key the little symbol wanted me to press and then I would memorize where my hands went and the progressions from one part of a piece to the next. I learned to play Beethoven's "Fur Elise" quite well and loved playing it with feeling. But I got frustrated when I couldn't master anything beyond that piece and eventually gave up. I ran into the same issues trying to learn acoustic guitar in college (well, I wasn't crazy about the sore fingers either). To this day, I still can't read music. But I'm so grateful for the opportunity I had to bring the joy of playing music into my life. An excellent read! Some of those clothes are covetable all over again now.. I'm with you. My blog is the place to find me. Isn't it great when you find an old photo that brings memories flooding back? I think I had a very similar look when I was 16 too! It really is great that a photos can bring so much back. I never mastered the piano either. This is wonderful - so many memories from the one photo! I took piano lessons for years, and I can read music, but I can't play anything competently now. It's such a pity; regular practice would have made a difference. I had the same experience as you with the guitar; the sore fingers ended it pretty quickly. What a great read. I thought you were much younger in that photo. Inspired by your (and Deb's) month of almost daily posting I've spent a pleasant hour revisiting my Blogtoberfest 2011. It's so great that one photo can bring back so many memories. Nice trip down memory lane!! I never got the opportunity to take piano lessons when I was a kid, but did take them as an adult. I was getting pretty good, but took time off to have a baby and move to Nashville. By the time I got back to it---about 18 months later, I had pretty much forgotten everything. I'm sure it would have come back had I stuck with it, but I was too busy with the baby!! Long hair parted in the center - yes, that was me, with the difference that my hair was curly and always looked unkempt. No matter what. It still does, but I don't mind anymore. Those jeans - oh dear, yes, we had them, too. I didn't wear flannel shirts though. At 16 I was a terrible teenager at a boarding school and just as horrible as everybody around me. Yuck! I think you look very sweet! That's a great idea to take a photo and write what it brings up for you - it tells us something about you then AND now. (And I'm a simple blogger too! ).